A beautiful and proportionate body is the wish of every woman on this earth. We all tend to find certain aspects of the body somewhat disproportionate or asymmetrical and wish that somehow we can change and improve it long-lasting and effectively. Breast enlargement procedures at Cocoona Center for Aesthetic Transformation in Delhi helps you achieve the desired body shape in the most effective and affordable manner. Breast enlargement (also known as ‘breast augmentation’) is one of the cosmetic surgical procedures that are used to increase the size or restore the size of the breasts to more proportionate size and shape. This is usually done using artificial implants made from silicone gel or saline-filled ones. In some cases fat is also sourced from another part of the body and transferred to the breasts to increase their size and shape. This is one of the most popular cosmetic surgical procedures performed at Cocoona and has helped numerous women to increase their self-esteem and boost their confidence significantly. When do I need Breast Enlargement? You are considered to be an ideal candidate for breast enlargement if your expectations and realistic and you are in an overall good health condition. What are the types of Implants used in Breast Enlargement? Due to the advances in medical and surgical science, there are now various types of surgical implants that are used in restoring and increasing the size of smaller breasts. These are filled with a special silicone gel which is meant to give the feel of natural breast tissue. In case the silicone breast implant springs a leak the gel remains inside the implant shell, or it may simply seep into the breast implant pocket. This type of breast implant does not collapse in case of a leak. These type of breast implants are filled with a special sterile saline solution which resembles the softness and shape of natural breast tissue. In case the saline breast implant experiences a leakage the saline solution seeps out of the implant shell and is gradually absorbed by the body while the implant shell collapses on itself. These are firm implants and maintain their shape even after the implant shell is broken. The special gel inside these breast implants is thicker than the silicone gel and is more consistent in maintaining the shape and feel of natural breast tissue comparatively. These are also more beneficial as they can be molded to resemble your natural breast shape rather than being simply round in shape as seen in other types of breast implants. These are meant to give the breasts a more round and firm appearance which is somehow not achievable with other fixed-form breast implant types. These are specially designed to be extra soft and smooth and can be fixed to be movable only in the breast implant pocket. This allows for a more natural feel and looks to the breasts along with increasing their size and shape. These are fixed with the help of scar tissue in the breast region for more stability and firmness. This allows them to be firmly fixed in place and restricts their movement within the breast implant pocket. These come in a variety of shapes and sizes and the expert surgeon will be able to best advise you on the best-suited textured breast implant in your case. Breast enlargement (breast augmentation) procedure is one of the most common cosmetic surgical procedures performed by cosmetic surgeons worldwide. The main aim of this cosmetic surgery is to increase the size, or restore, of breasts to larger and more natural size and shape using special artificial breast implants. There are various types of breast implants available today but the surgical procedure for implanting them in the breast region is similar in nature. 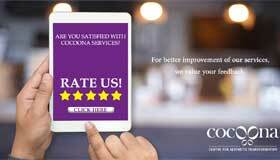 The expert cosmetic surgeons at Cocoona will administer general anesthesia prior to the cosmetic surgery in order to prevent any form of pain or discomfort to you during the surgical procedure. The next step usually involves making an incision, mostly under the breast, using a very fine scalpel. This lets the surgeon access the inside of the breasts. The surgeon will then lift the breast tissue flap to create a considerable-sized pocket for the breast implant to be fixed. Then the surgeon will then fix the ideal breast implant using the required method (fixed-form or movable/mobile breast implant). In addition to this, there are cases when the cosmetic surgeon might opt to use fat transfer methods for enlarging the size and shape of the breasts. This is performed by sourcing autologous fat from the patient’s body itself and transferring this fat into the breast area. The surgeon will remove the fat gently using minimally invasive liposuction technique from the thighs, sides or the abdomen. This fat is then treated and injected into the breast region. This is also one of the reliable forms of cosmetic surgeries that help with breast augmentation. Cocoona Center for Aesthetic Transformation in Delhi has helped thousands of women get the desired proportionate body shape using advanced and effective breast enlargement cosmetic surgical procedure at the most affordable cost to the patients in India.